These lakes, many of which are no more than 3m deep, melt earlier in the season and retain open water conditions for much longer. And 20 years of satellite radar also now show that far fewer will freeze right through to the bottom in winter. The results of the space-borne survey are published in The Cryosphere. What is happening to the lakes is an example of how land ice is following the pattern of diminishing sea ice in the region, say scientists. "The decline after 2006 is quite sharp," explained Dr Cristina Surdu from the University of Waterloo, Ontario, Canada. "This is another piece in the puzzle of climate change in the region. "We're seeing warmer air temperatures; we're seeing sea-ice extent decreasing; and we're seeing a general greening of the Arctic with the treeline moving north. The lakes are part of that story." Surdu's and colleagues' research focussed on an area near Barrow, the largest settlement on Alaska's North Slope. It encompassed more than 400 lakes that individually have surface areas up to 60 sq km but which are about, in the main, just 1.5m deep. The lakes tend to be completely ice free in summer for a short period of roughly 8-10 weeks and then freeze up again with the onset of colder temperatures in Autumn. The team used radar data from Europe's ERS satellites in the 1990s and 2000s to track the progression of the freeze-up. Orbital radar can sense the presence of liquid water on the ground even when it is covered by tens of centimetres of ice. The energy of the signal scattered back to the satellites is significantly different when some water is retained. And what the scientists could see over the course of the study period was that a smaller fraction of the lakes' ice was freezing right through to the bed in winter. From 1991 to 2011, the fraction of grounded ice present by the end of the freeze-up in April had declined by 22%. Modelling work suggests this is equivalent to the lakes' ice caps being reduced in thickness by 18-22cm. The change in the lakes' behaviour almost certainly reflects the warmer conditions in the region. 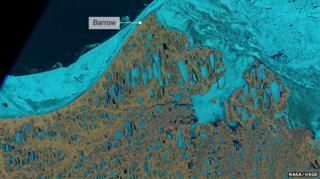 The mean air temperature in Barrow, for example, increased by 1.7C in the first decade of the 21st Century. But it also reflects shifts in precipitation. "Snow is a very important factor in all this because it is an insulator," explained Dr Surdu. "If it falls at the beginning of the ice season, it slows down the thickening of the ice on these lakes; whereas, if it falls at the end of the ice season, it helps retain the ice because it insulates that ice from warming temperatures. "But what we're actually seeing is more snowfall at the beginning of the ice season and so the precipitation is working against the ice." The presence of more liquid water underneath the lake ice is likely to have a number of impacts. One is to change the lakes' ecology. For people, some impacts, such as the availability of more fresh water, will be beneficial. But other impacts will cause difficulties. An example would be the "ice roads" driven across the lakes in winter by the trucks that supply Barrow and neighbouring communities on the coastal plain. Continued thinning could limit the roads' use in future. The warmer conditions in the lakes also have important climate feedbacks by disturbing the underlying permafrost and transferring more heat back into the atmosphere in autumn. These effects work to amplify the changes already under way. The study used European Space Agency satellites that are no longer in operation. But Esa is about to launch new radar spacecraft under the EU's Copernicus-Sentinel programme. With the promise of two identical radar satellites flying at the same time, it should make studies such as this one far easy to conduct. The Sentinels will return more data more frequently.